The book's new introduction covers basic questions about soft drinks, their ingredients, and packaging. 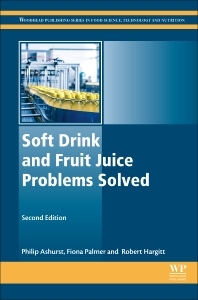 Additional new chapters expand on microbiological problems, shelf life and storage, and fruit juices and nectars, as well as product nutrition and health claims. Final chapters offer soft drink and fruit juice data sources. Philip Ashurst has been involved in the beverage, brewing, flavour and extract industries in both technical and general management roles for many years. Now a consultant, he specialises in the scientific, financial and legal aspects of the beverage industry worldwide. Bob Hargitt is Technical Executive of the British Soft Drinks Association. Bob Hargitt has worked in R&D and technical management roles in the brewing and soft drinks industries for over 35 years and is a Retired Technical Director of the British Soft Drinks Association, UK. Fiona Palmer is a Technical Director of British Soft Drinks Association, UK. She has been in worked in R&D roles in the soft drinks sector for over 25 years, working as development manager for Britvic for 11 years. She took over from Bob Hargitt as Technical Director, British Soft Drinks Association on his retirement in 2012.